Quick Note: This post contains affiliate links. Please read my disclosure statement for more details. Thank you! Follow My Kitchen Serenity on Facebook, Pinterest and Twitter! There is nothing I love more than bread! Any kind of bread, really. The best bread is homemade bread from scratch. It’s so fresh, soft, and tender. Eat it right away with butter, or eat it later as a sandwich, french toast, or grilled cheese. 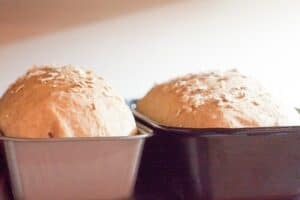 Making homemade bread is a process that takes time but it’s worth it. Maybe it’s something you wouldn’t do on a routine basis because we are all so busy. But when you do take the time to make this bread, it just makes it that much more special. 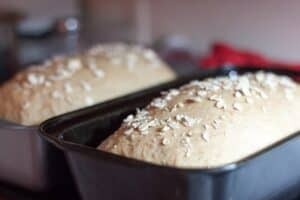 Even if you are new to making bread, you can do this! I recommend using a mixer with a dough hook, like this one, since the dough can be a bit sticky, but if you don’t have one you can still make it and hand knead the dough. You’ll need a little extra flour because of the sticky dough. Have 4 bowls ready for mixing (three small-medium and one large). First, mix 2 tsp of yeast and 1/3 cup of warm (NOT HOT!) water into a small bowl, stir and set aside. Then, in another bowl, mix 1 cup of boiling water with 1-1/2 cups of rolled oats and set it aside. Let both bowls sit for about 10 minutes. Mix buttermilk, oil, and brown sugar in another bowl. 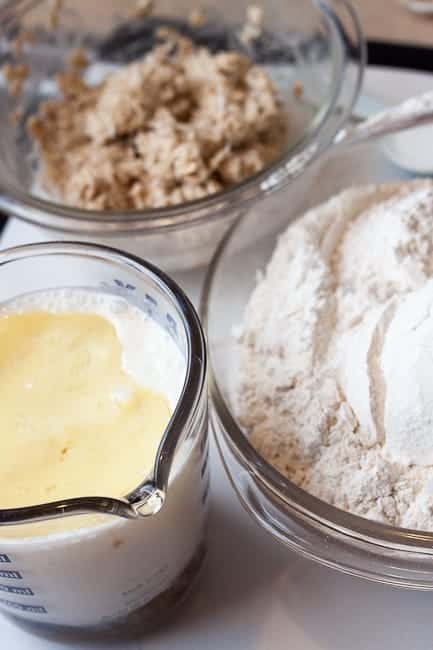 Mix the flours together in a separate large bowl to blend. Add the contents of all four bowls to the mixer (except the salt). Knead with the dough hook for 3 minutes and let it rest for 20 minutes. Come back, add salt, and knead with your mixer on medium for 15 minutes. 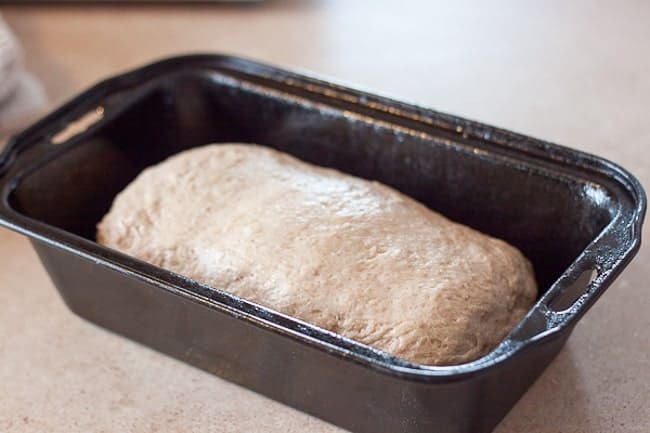 Turn dough out into a well-oiled bowl, turn to coat the dough, and then cover with plastic wrap and let rise for about 1 hour, or until doubled. Divide the dough in half. Put one half of the dough on a lightly floured surface, and shape into a loaf. Repeat with the other half of the dough. Place into prepared loaf pans that have been sprayed with non-stick spray. Lightly brush with water and sprinkle a few additional oats on top of the dough. Let dough rise in a warm place for an additional 30-60 minutes. Bake in a preheated 375F oven for 30-40 minutes, or until the crust is golden brown. 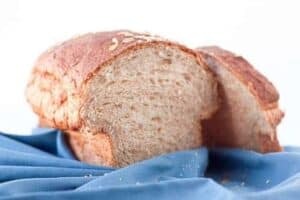 A classic homemade oatmeal bread made with flour, yeast, rolled oats, buttermilk, and brown sugar. 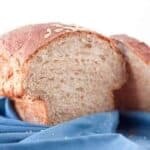 An easy bread recipe for beginners and kids. I hope you enjoy this bread! Let me know how it turns out. I’d love to hear from you! Try some of My Kitchen Serenity’s favorite recipes.